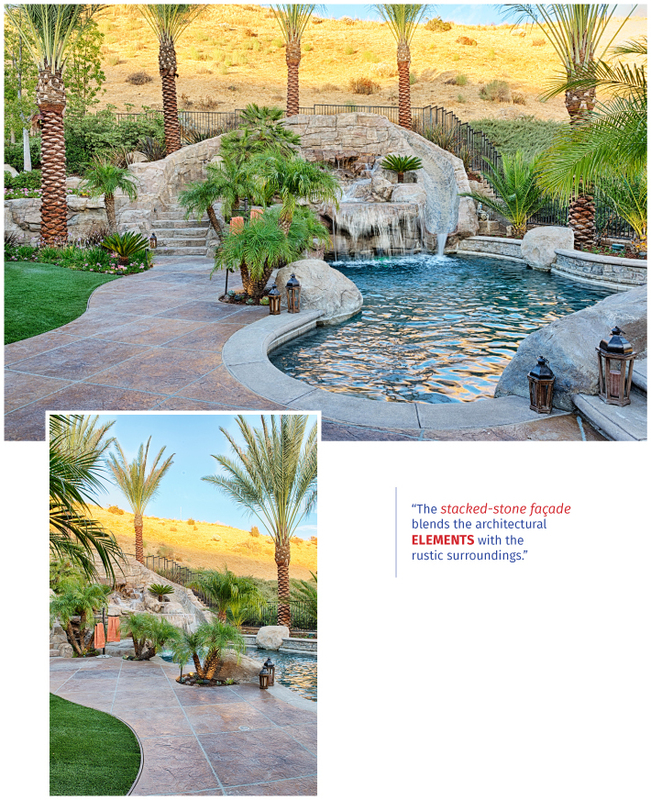 The yard's stamped concrete is a study in craftsmanship. "It has chiseled edges and was grouted out by hand, then stained, so that the final look is similar to individual stone tiles," explains the homeowner. The Hanamint dining set was selected from Oasis Garden & Patio. "My wife saw it and fell immediately in love, especially when she realized that it can seat eight," recalls Andy Machado. "We do a lot of entertaining; we need places to put everyone!" 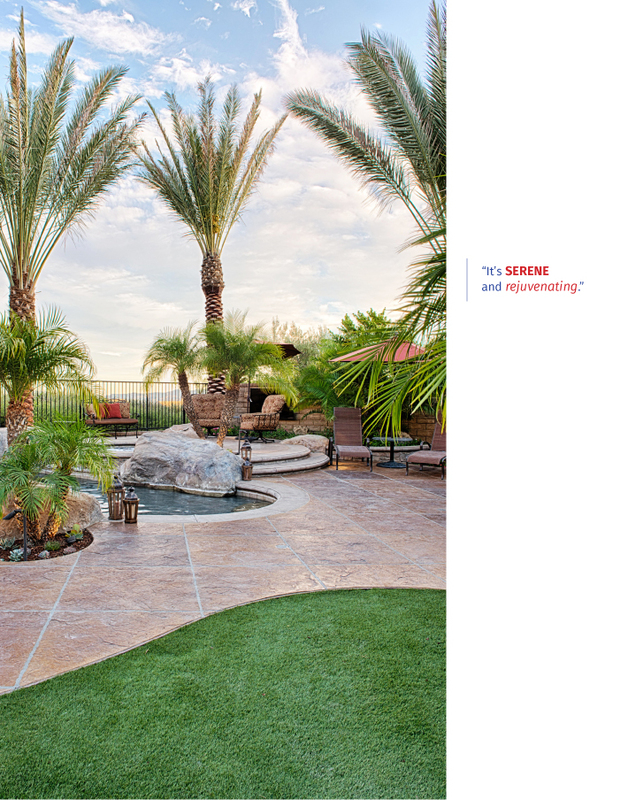 The Machado family's Tesoro Encanto home, beautifully situated on a 13,000-square-foot flag lot at the end of a cul de sac, is often the beginning of something special, thanks to the expansive tropical escape in the backyard. 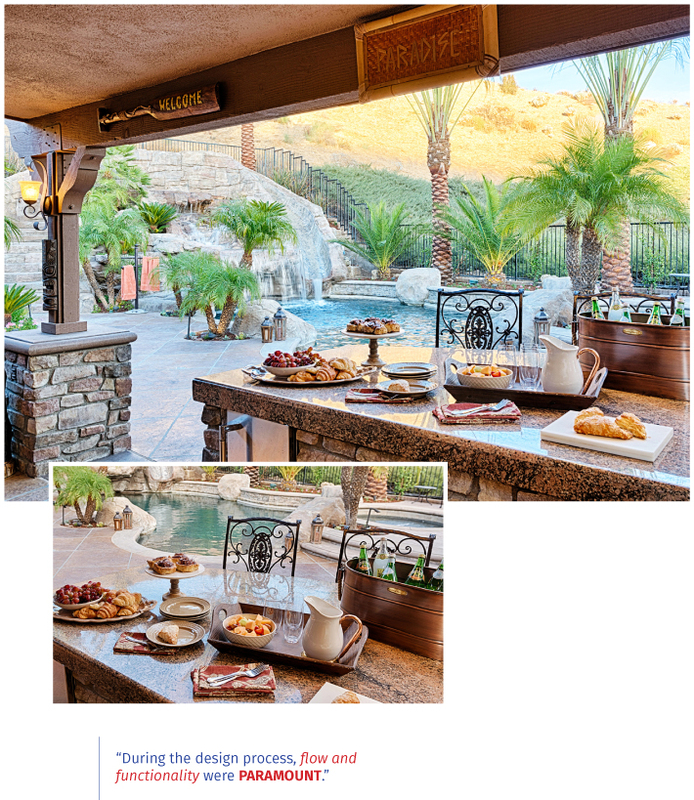 ABOVE The outdoor kitchen's granite countertop naturally withstands Santa Clarita's inclement weather, while the rustic-brick veneer casually coordinates with the stacked stone in the adjacent tropically-inspired pool. INSET Metallic copper accessories reflect more than good taste; shades of glimmering golds are a timelessly-luxurious foil to natural stone and foliage. "It's a complete entertainer's yard," says homeowner Andy Machado, a general contractor who shares the home with wife Aimee and daughters Ashlyn, Alyssa and Ayvree. "We constantly have people over, the kids have friends over. Every weekend feels like a party!" ABOVE Kids and adults of all ages take full advantage of the yard's nature-inspired water slide, which deposits adventurers into a cascading waterfall. "We celebrated my daughter's graduation yesterday and her friends couldn't get enough of it," says Machado. "It's the star of the show out here when the kids have friends over." The Pebble Sheen pool, free formed and hand designed by a local contractor, has a stacked-stone facade similar to other elements in the yard and around the home. The result is a look of refined cohesiveness. INSET Date and robellini palm trees add a decidedly tropical touch to the SCV home. "We wanted to achieve a sort of mix of Las Vegas and Hawaii aesthetics," says Machado. "That tropical resort look makes it feel like a real escape from the rest of the world." Except, of course, when it doesn't. Thanks to the rustic surroundings, the Tesoro estate benefits from the surrounding peace and quiet. "When I'm outside working or restoring cars, it's so calm and relaxing. That's one of the biggest advantages of living up here," says Machado. 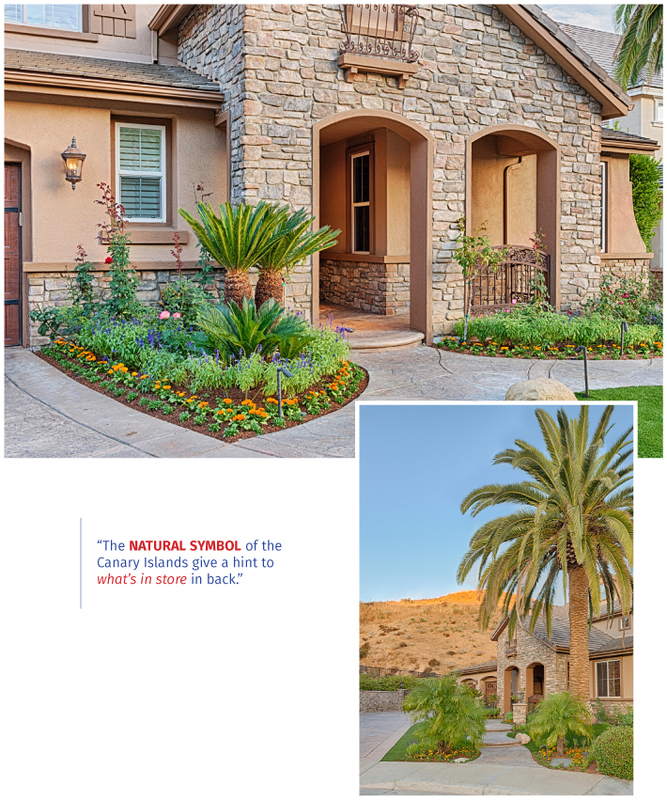 The homeowners selected drought-friendly succulents and artificial turf to complement their yard's design. "Everything's on a drip line, which makes water use much more efficient and convenient. It's very low maintenance," says Machado. "We're cognizant that Santa Clarita will always require some level of water conservation, and we wanted to be respectful of that." When not throwing graduation parties or entertaining kids of all ages - their children range in age from 7 to 18 - the Machados take advantage of the opportunity to "check out" from life's hustle and bustle. "Aimee and I chill out back here a lot. It's where we take a break from all the kids' activities, put on some music, have a glass of wine, read a book and just relax. It's serene and rejuvenating," says the father of three. ABOVE The home's entry is marked by a welcoming pair of double arches. The stacked-stone facade blends the architectural elements with the rustic surroundings. INSET Phoenix canariensis palms flank the front; they're the natural symbol of the Canary Islands give a hint to what's in store in back. Hanamint and OW Lee furniture and accessory selections from Oasis Garden & Patio (255-9909) make the space even more inviting. "All our furniture was picked out at Oasis," says Machado. "They have a great variety of really beautiful pieces and wonderful customer service. They are always really nice to work with."